This bulletin board is a culmination of our Literature Circles during December. Four different groups of students chose books to read. They conducted self-directed reading circles and discussion groups. At the end of the books, the students got together to choose the background color of their quilt squares (according to what color they thought best represented their books) and then in the border area of the quilt square they had to decide on three symbols that would represent their book choice the best. Each student in that group then used those symbols in their border. 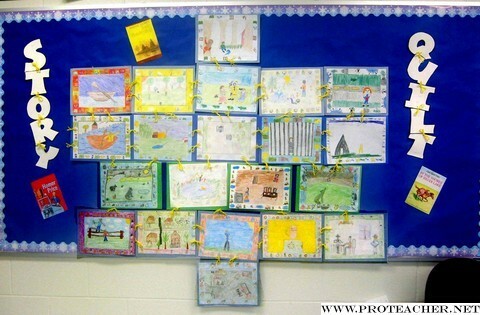 The center picture was reserved for each student's personal drawing of a favorite scene in their story. On the back of their pictures they were to describe the scene they chose to depict, what each of the border symbols represented, and why their group chose the background color that their quilt squares were on. The quilt squares are connected with yarn. The title letters of the bulletin board "Story Quilt" are also hooked together with yarn.